My friend Shannon had a children's birthday party and she served this delicious sweet meatballs. The kids loved it and the big kids like me loved it too! She shared the recipe and one day I saw a bag of meatballs in the freezer and I decided to make it for dinner. I looked for the ingredients in my not so organized pantry, seriously who has an organized pantry besides Martha? Of course! I didn't have the grape jelly it required!!! No one eats grape jelly in my house! Why? I don't know why? My kids just don't. Like most of the "don't like this and that" food in their short list of food likes. I looked in my fridge and looked for something I can substitute the grape jelly with. I make cranberry sauce all the time, this is pretty much a staple in my fridge. I love cranberry sauce with my roasted poultry, in my pork or on my bagel with cream cheese. That's how this happy accident recipe came about. 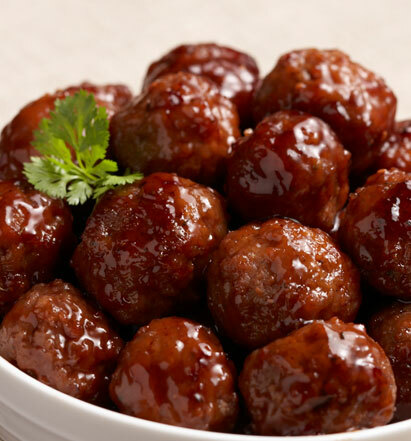 Pour the meatballs, cranberry sauce and BBQ sauce into a crock pot and stir until well combined. Cook the mixture on high for 2 – 2 ½ hours until completely cooked through. Serves about 60 – 64 bite-sized meatballs.